Networking is important in all careers, and the legal field is no different. Whenever I can, I combine networking, quilts and the law. Recently, I had the opportunity to catch up on the lives of several young women who are former staff members of the Fulton County Attorney’s Office. They joined me for Wine and Words at Hammonds House Museum. The Wine and Words program features an opportunity to network and to meet a featured author up close and personal. On this particular occasion, the author was Irene Latham, author of Leaving Gees Bend. The program was part of the 2010 Atlanta Quilt Festival and was a collaboration between Written Magazine, Hammonds House and the Clara Ford Foundation. What a surprise when, in addition to other close friends, former staffers June Green, Rolesia Dancy, Brenda Woodard, Valerie Ross, Paula Nash, and Carmen Alexander. All of these people own quilts I made for them, so you know they must be special. Seeing them, I could not help but reminisce about the early days in the Fulton County Attorney’s Office. 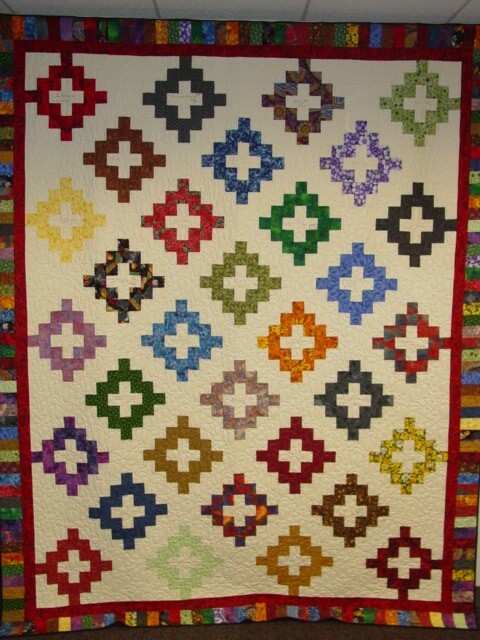 They graciously allowed me to practice my quilting on them and always acted as if everything I made was beautiful. Shown here is my quilt Fulton County Attorneys, the first of many office signature quilts that graced our conference rooms. All of these ladies signed a block in this quilt.